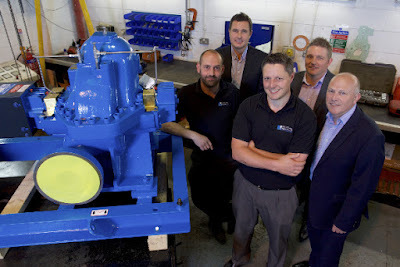 Rotherham-based pump supplier Industrial Pumps is set for further growth and new jobs after undergoing a management buyout, with the help of a significant investment from UK Steel Enterprise. Founded as a partnership in 1988, Industrial Pumps started trading as a Limited Company in 2006. Originally a Mono distributor selling pumps/spares and solutions, the Barbot Hall Industrial Estate business quickly moved into pump repairs and other general engineering. Existing company directors David Carley and David Stacey, who have both worked at Industrial Pumps since trainee level in the 1990s, have bought the business from previous owner Chris Garner. They have now revealed expansion plans which build on the company's reputation and recent growth which has seen turnover double to around £4m in the last four years. UK Steel Enterprise, a subsidiary of Tata Steel, provided investment through its Equity Growth Fund, which is backed by the Government's Regional Growth Fund. The deal was referred by John Parkin of PKN Chartered Accountants in Rotherham. The funding is expected to facilitate continued expansion of Industrial Pumps across its impressive customer base, which includes water utility companies and leading OEMs; as well as enable the company to improve its digital platforms and create new jobs in Rotherham in the coming years. The buyout sees David Carley take on the role of managing director – having started as an apprentice pump fitter in 1996; and David Stacey take up the post of sales director having joined as a trainee tech sales agent in 1998. David Carley, managing director at Industrial Pumps, said: "This investment from UK Steel Enterprise has provided us the opportunity to carry on building the company’s reputation and work towards our ambitious growth plans. "Our immediate vision is to take the company into both new long-term contracts in the utility and industrial sector, whilst also ensuring that the existing employees have both security and opportunity to progress as well as recruiting for new roles from across the region." Allan Wood from UK Steel Enterprise, added: "Industrial Pumps is a great example of an already successful South Yorkshire business, with significant opportunities for further expansion. We have backed them because we believe they can grow and create more jobs locally." Part of the Equity Growth Fund is aimed at young, early stage companies with high growth potential, while established companies can apply for amounts up to £1m.